Rather than a written exam, you will be assessed on your academic paper, a presentation, and an oral defense of your research. The academic paper is between 4,000-5,000 words in length, and the presentation and defense take 15-20 minutes. You will also be required to answer 3-4 questions from a panel of trained evaluators and your AP Research teacher. Note: You must submit all performance tasks, and your presentation and oral defense must be scored by your teacher, no later than May 2, 2019 at 11:59 p.m. ET. 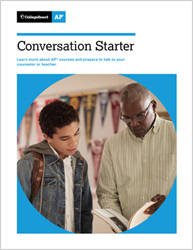 See your AP Research teacher for specific deadlines.